One of the bigger challenges facing Toronto in 2061 is going to be the aging population. Check out the graph below. 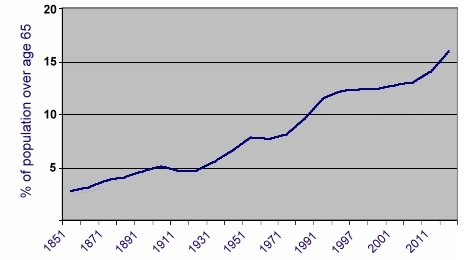 It shows the steady rise of the population over 65 over the last 150 years. But if you think this graph is shocking, consider this statistic; the number of people aged 100 or older increased 50 percent between 1996 and 2006, and is set to triple to more than 14 000 by 2031. Meanwhile, Canadians are having fewer babies, shifting the historical balance between the young and the old. Okay, just a little math here; I could be looking after my parents well into my 80’s. In 2009, a Canadian Special Senate Committee on aging produced a report outlining many of the challenges that will face our country over the next few years. Their report showed that most Canadians want to stay in their communities as they grow older. Others want to move closer to family and friends. Some choose to stay in their own homes, while others want to move into housing that requires less maintenance or provides supports to daily living. The choices available to seniors depend on many factors, including their health status, where they live in Canada, whether they live in an urban or rural setting and their financial situation. So where am I going with this? In my last post I wrote about Toronto’s need to develop laneway houses similar to the ones in Vancouver. These homes have many adaptations not the least being to provide housing for aging relatives. So the question struck me, what if someone was a condo dweller. Would it make sense to provide a different mixed use condo/retirement development similar to the hotel/condo model currently in existence? Developers have always struggled with the lower floors of buildings. We have seen podiums as town houses and ground floor retail and second floor party and exercise room combinations because, it seems, that no one wants to live in the first three floors of a condo building. Several years ago the lower floor hotel model took hold in Toronto with Trump Towers, The Ritz, The Thompson Hotel and The Hazelton Hotel. The reality however is that we can’t just keep building hotels, so why not retirement facilities. Great Gulf Homes entered the retirement living sector a few years ago with The Russell Hill. They have done a remarkable job with that project. Perhaps we should be expanding on their model by providing more housing to our own aging population. Great post Mark… This could definitely be a great use of space that has traditionally underperformed.